At some stage during its quest for Jogo Bonito, Brazil decided it needed insurance, (writes James Nalton). Once a nation famed for churning out an endless stream of attacking talent which would eventually make its way to Europe, it’s now a talent factory just as useful for the holding midfielders used to provide cover for these free spirits. The country of Pelé, Garrincha, Jairzinho, Ronaldo, and Ronaldinho et al, also produced Mauro Silva, Mazinho, Dunga, Gilberto Silva, Casemiro, and the original defensive midfielder — back in 1958 when Jogo Bonito was real — Zito. The likes of Fernandinho, Fabinho, Allan (Napoli), Luiz Gustavo, and the aforementioned Casemiro are among the players continuing to fly the Brazilian flag in this position. There are also a number of player ready to come through and make an impact. Douglas Luiz on loan at Girona from Manchester City, Lille’s Thiago Maia, and Fluminense’s complete midfielder Wendel are all 20 or under, but one player in this age group has already broken into the senior national team setup. It’s customary to give Brazilian players their full name first before reverting to their nickname for the benefit of the remainder of the commentary, so Arthur Henrique Ramos de Oliveira Melo, known as Arthur Melo, or simply Arthur, is another all-round midfielder who’s currently plying his trade at Porto Alegre based side Grêmio. The 21-year-old has already made into a Brazil squad, and though he’s yet to make the Selecao, that he’s in the picture at his age while still plying his trade in Brazil says a lot about his talent. He’s the youngest domestic based player to be called up to the squad in recent times, and one of the youngest full stop, with only 20-year-old Manchester City striker Gabriel Jesus and 21-year-old Monaco left-back Jorge of his age or younger receiving Brazil call-ups in 2017. Tite thinks so highly of Arthur because of the way he is able to control the midfield on both sides of the ball. 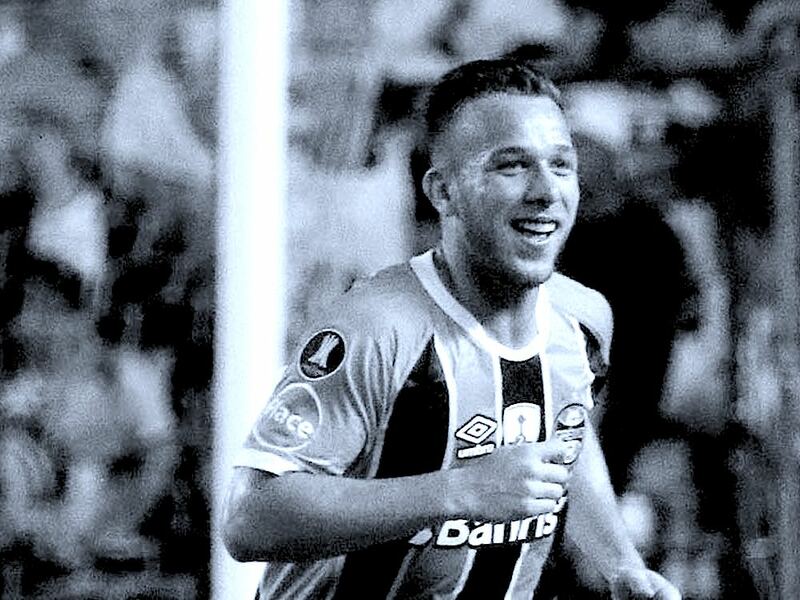 The Brazil coach recently went to watch Arthur play in a match between Gremio and Botafogo, and returned with a glowing report. “When I went to the game, I wanted to see the atmosphere,” said Tite. As well as being mentally strong, he’s one of the more reliable players when it comes to fitness too, having played more minutes than any other Gremio player in the Brazilian league this season. He boasts a pass accuracy of 93%, the highest in his team, and operates as both a deep lying and advanced playmaker. He regularly has more touches of the ball than most of his team-mates, and spreads these out equally in both halves of the pitch. 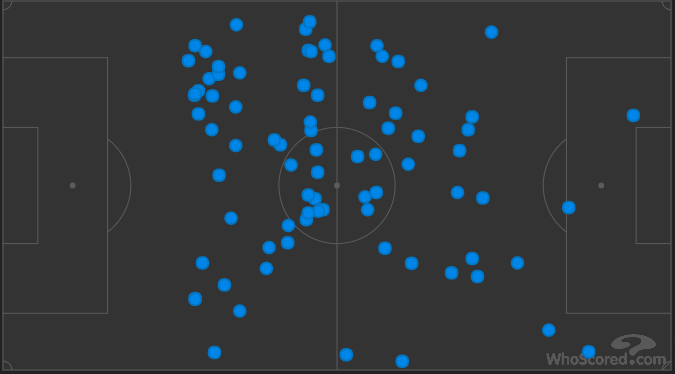 The example below shows his touches of the ball from Grêmio’s game against Corinthians. Looking at this image it would be impossible to tell which way his side were attacking, such is the range of touches in both halves (Grêmio were attacking right to left, and those touches in his own area are clearances). While he does have a good positional awareness when it comes to defending, and averages two tackles and one interception per game this season, there is no doubt that his skills lie in the control of the game through possession and the building of attacks. Here’s an example taken from Grêmio’s Copa Libertadores semi-final second leg against Barcelona (Ecuador). He receives the ball under pressure, but he beats the first man with his first touch as he lets the ball run across his body, then slices the opposition in half with a pass through to the striker with the outside of his right boot. He’s the man who makes the pass before the assist, or even the one before that, and obligatory comparisons with current or recent stars have labelled him the new Thiago Alcântara, or Andrés Iniesta. Comparisons are helpful to see what type of player a young footballer has the potential to be, but while they are handy for the observer they can place huge weight on the player’s shoulders. However, these tests are always a good indication of whether a player can cope with the pressure and go on to forge their own identity rather than constantly be compared to others, and along with the likes of Gabriel Jesus, Neymar, and Philippe Coutinho before him, Arthur could do just that. “I do not know if, in nine months from now [at the World Cup], he will have a place [in the Brazil squad],” added Tite. This comparison is apt, despite the players’ different positions, and it suggests that Arthur is a move to the right club in Europe away from furthering his development and receiving another call-up which leads to a first cap. But it has to be the right club. The timing of Jesus’ move to Manchester City was perfect as he is the ideal player for Pep Guardiola, as Arthur himself may also be. With Fernandinho advancing in years, and Yaya Touré seemingly on his way out, the young Brazilian could be the Catalan manager’s alternative to İlkay Gündoğan in the midfield hub. Failing a move to City he should have no shortage of interest from other clubs, which means it will be important he makes the move for football reasons to prevent him becoming another promising Brazilian player lost in the outskirts of Europe. He recently extended his contract with Grêmio until December 2021, but this deal also included a release clause of €50 million, which is usually a sign that there is interest in the player and the club want to sell, but only at the right price.